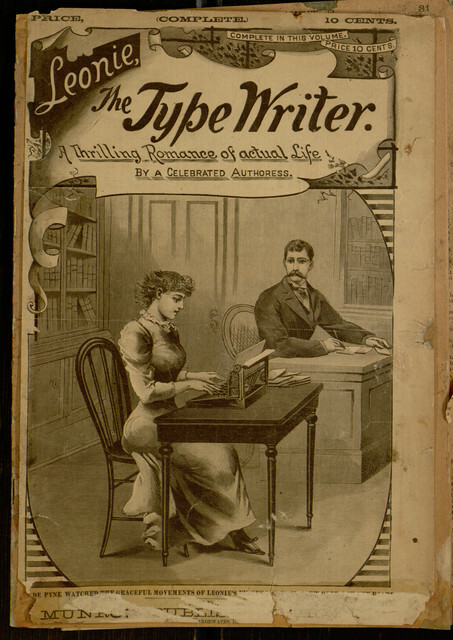 Our latest proofreading project is Leonie, the Typewriter, a self-described “thrilling romance of actual life,” from the days when a typewriter was not just a machine, but also the person who operated it. Like several of our previous projects, this tale originated in the pages of the New York Family Story Paper. The copy we have digitized is a later stand-alone reprint. Unfortunately, the condition of the book is rather poor, making this a more challenging project than usual; however, with some perseverance, Leonie will live again! Please join in the work at the Distributed Proofreaders project. If you are new to distributed proofreading, you can read more about our proofreading effort. Once you are ready to help, just visit the project page and start proofing!